July 1, 2016, 10:56 AM · Any violinist who wishes to play the instrument's most stunning virtuoso literature, not to mention the best of Bach, must master the double-stop. And to master the double-stop, one must make friends with the double-stop scale. Of course, regular scales present difficulty enough. But sliding up and down the fingerboard with accuracy on two strings, two fingers by two -- this complicates matters a great deal more. One's first efforts with double-stop scales can be painful to both the ears and the fingers, and they don't necessarily improve quickly and easily. In college, and even before, I was assigned double-stop scales, and I labored over them in vain. I'd played regular scales for a long time, and I did appreciate their power to improve my technique. Unfortunately, I mostly found frustration in double-stop scales; they never seemed to improve beyond a certain point. Certainly any ease of execution was eluding me. I began to view them not as a friend, but more as a nemesis! 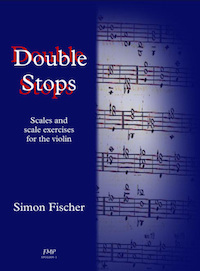 So when I heard that Simon Fischer was writing a book called Double Stops: Scales and Scale Exercises for the Violin, I was skeptical, despite being a fan of his work. Simon is author of violin pedagogy books Basics, Practice, Scales and Warming Up and The Violin Lesson. What good could it do, to practice double-stop scales, when I'm just not very good at double-stop scales in the first place? Let's just say that if my teacher had given me Simon's exercises, I wouldn't be asking that question! Simon's book doesn't just present a series of double-stop scales to play (as my technique books did), it breaks them down into their simplest components, with exercises that lead step-by-step to the end result: the actual scale. For example, if you are working on scales in thirds, he has devised 20 exercises, and only the last one is simply playing the scale slow and then fast. The book includes thirds, sixths, octaves, fingered octaves and tenths for all major and minor scales, and he explains how to do each exercise in detail. It's an exciting development, to have a book like this available. I spoke to Simon about how he came up with these exercises and how best to use them. Laurie: How did these sets of exercises evolve? I've never seen anything so detailed! What was your inspiration? Simon: A direct inspiration was possibly the Jahnke Double Stops scale-studies book (very hard to get hold of in the West), which also has several pages of preparatory exercises before you finally get to the scale at the end. Having started off with the Carl Flesch Skalensystem as a teenager, I ditched it as soon as I discovered the Galamian scale books. But while they are very clever, I was never really happy with all those stemless notes, and the moment I came across the Jahnke scale books I was never interested in Flesch or Galamian again, either for my students or for myself. However, although I have really appreciated the Jahnke for many years, the double-stop exercises are slightly repetitious and much of the same ground seems to be covered more than once. By contrast, each exercise in Double Stops explores a different technical aspect or focuses on new territory, and builds the whole spread of technical ability in the process. Basically, all I was trying to do was to help my students prepare for their technical exams. Instead of showing them various ways of practicing, and suggesting (and hoping) that they practice all the double-stop scales in the same ways, I wanted them to have all the most targeted, most effective practice methods all just sitting there on the page, written into the scale, ready for them to play. So one aim was that the content of the book be essentially just best-ever practice written-out – so that if you do what is there, you are by definition practicing as well as you possibly could be. I always remember, from when I was about 14, seeing a review in The Times of a performance of the complete solo Bach given in London. I'm sorry that I can't remember who the violinist was, but the critic spoke about all the "customary scratches and scrapes, and forced, sour tones" of the violinist – or something along those lines – and went on to explain that composers such as Bach wrote "beyond the scope" of the instrument because they were writing pure music without regard to the instrument's technical limitations. Therefore, he explained, of course the playing was full of scratches and scrapes and sour tones – it isn't possible for it to sound otherwise, and one must imagine the music more than listen to it. Of course, this is complete and utter nonsense. Composers such as Bach knew exactly how to write for the instrument, and not one single double stop in the complete unaccompanied Bach is impossible to play purely and in tune. The review reminds me of one of the best violin jokes: What's the definition of a "double-stop"? Answer: Double-stops are when one previously good-sounding violinist suddenly sounds like two bad violinists playing together. Triple and quadruple stops? When one previously good-sounding violinist suddenly sounds like three or four absolutely dreadful violinists playing together! It's only funny because it is so often the truth, but the best players prove that such playing is absolutely unnecessary and avoidable. My hope is that Double Stops is powerful enough to enable even less-advanced players to make real progress towards secure and easy double-stop playing. Laurie: Were there any other teachers or sources that taught similar exercises, or did you create them all? Simon: A small handful of the exercises are obvious and well-known – for example, to play first the lower note of an octave, then the upper, then both together; or inserting fourths into a run of thirds; or practicing in rhythms. There is also one that I learnt from my teacher Yfrah Neaman, and a Dounis-type exercise similar to one in The Artist's Technique. But most of the exercises are entirely new. Some have come about through taking a double-stops exercise from Basics and devising step-by-step, logical sequences out of it in the key of the scale. For instance, shifts with intermediate notes which clarify exactly how to shift from one double stop to another, or string-crossing exercises, or uniform-intonation patterns which so easily reveal when a note is fractionally out of tune. Laurie: At what point is a student ready to start learning double-stop scales? Simon: Surely the simple answer is as soon as possible. By the time a child or an adult can play simple tunes, they are already ready to start playing two notes at the same time - I mean easy double stops, not fingered octaves! Once they are able to play single-note scales with shifts, by definition they are ready to start on double-stop scales. The part of childhood that the teacher must surely capitalise on is the fearlessness that comes with it. The teacher must have an attitude of "of course you can do it, it's nothing." If a child senses a sort of trepidation on the part of the teacher, they will naturally be afraid of double-stops themselves, and become hesitant. The other reason for beginning double-stops as soon as possible is that they make single-stops feel so easy. There is nothing better than thirds and octaves to encourage a good hand position with the fingers hovering above the strings. This is a side to this new book that I am really thrilled about – that it doesn't just improve your double-stop scales, but vastly improves all of your playing. After doing these exercises your left hand feels invincible! I think that feeling of invincibility happens firstly because all the note-comparison and note-isolation patterns force you to listen in an entirely new way; secondly because the exercises constantly encourage you to lighten the fingers, so that afterwards the fingers feel incredibly free and responsive; thirdly because some of the exercises are to improve the basic set-up of the left hand and fingers; and fourthly because the patterns map out the fingerboard so clearly in the mind that afterwards there is a feeling of really knowing each finger on each note, wherever it is. Laurie: Are these exercises in the order that you would have people learn them? 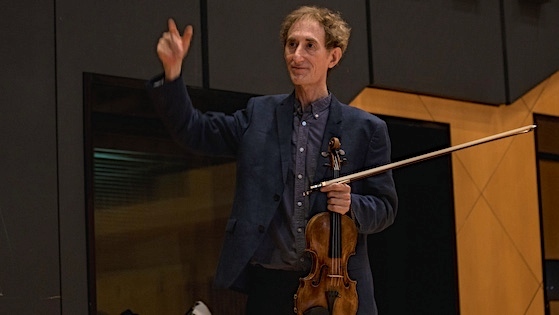 Simon: There is a logical progression from beginning to end in each section, beginning with getting the third tones in tune and setting up the left hand, progressing through shifting and string-crossing shifts, and ending up with the complete scale. The point is the difference between a "scale book" and a "scale study book." The trouble with the former, such as the Flesch, is that that there is no help offered – you are simply presented with THE SCALES. Double Stops targets each technical aspect of the scale one at a time and gradually assembles the parts as you go. The complete scale is the final thing you get in each section, after three whole pages of exercises that highlight each technical feature. In a standard scale book, that last line is all you get. Laurie: Say I'm working on thirds; you have 20 steps for mastering a 2-octave scale in thirds. How many steps should I aim to do in one practice session? All of them? Less? All in a week? If it depends, then can you give some parameters for when to move on, etc. For example, how much would you assign to a typical student for a week's work? Simon: For more advanced players, the best is to play through the whole section of thirds in one go; or if you do not have time, to spread the whole section over one or two days, or however long you need. For less advanced players, the teacher can select certain exercises according to which aspects of technique the pupil most needs to develop. They could do just one exercise from each section (of course leaving fingered octaves and tenths until later). I think it is important not to get stuck on trying to do one thing "perfectly" – it is much better to do just enough work to make some progress, and then quickly to move on. It's really helpful if you mark with a tick everything you play. Then you can practice for just as long or short a time as you like, and play whichever exercises you like and in whatever order, and always be able to come back on another occasion and continue where you left off. On that basis, I'd recommend practicing a whole key at once, not just one section. A little work on each type of double stop, even just one exercise in each, soon adds up. It is always very rewarding and motivating to see ticks building up, and whether it takes a day or a week or a month to tick every exercise in a key is surely not the point. The essential thing is to cover lots of ground, since everything you do improves everything else you do. The work you do on the new exercises improves the previous ones anyway, without you needing to stay on them. Laurie: I noticed that you frequently repeat the admonishment not to move the fingers, once placed, but to leave them there and then see how accurate the attempt was. Why is this important? Simon: This is only in one of the thirds and fingered octaves exercises, where you place all four fingers together and see if you can get them in the right spacing pattern for both intervals. In fact I learnt this exercise from Yfrah Neaman when I was 18. He mentioned it once only in passing, telling the class that someone in America had recently shown it to him. Anyway, I found it rather difficult and never tried it much, and it is an exercise I did not put in Basics or anywhere else. It was only in recent years that I realised that although it does seem difficult in the beginning, the exercise becomes easier more quickly than you might think it would. I am very good at it now, after not that much practice – I wish I could show you! But whether you can do it at first, or not, is not the point. The benefit of such exercises is usually as much in the trying, and afterwards you find that things have improved even though the exercise itself was not entirely good or successful. Also, as Galamian would tell you, practice is not about training muscles but training the mind, since everything comes back to the directions sent to the muscles. So this exercise is actually one of mental control, as you picture the intervals and the finger spacing, not a physical exercise at all. Again this is why playing anything feels so good after doing the exercise: it is because you have strengthened your mental picture, which is just like strengthening mental muscles, that you seem to know so well now where everything is on the fingerboard. Laurie: How do you avoid injury, if you are practicing double-stops diligently? Simon: The most important thing is to keep the left fingers as light as in playing single notes. To avoid tension, the normal amount of finger-pressure should always be 'just as much as necessary for a pure tone,' and no more. While the weight of the bow, in playing a double stop, is spread between two strings, so that therefore you generally need more weight to play a double stop than a single stop at the same volume, double stops do not require double finger-pressure; triple stops or quadruple stops do not require triple or quadruple finger-pressure. Instead, even in chord passages the left fingers can be feather-light. This is the "secret" to being able to run around fast in double stops. Another essential thing for most double stops is that the hand be balanced on the upper finger, with the lower finger reaching back, rather than based on the lower finger with the upper finger stretching upwards. That doesn't apply to sixths, but again this basic hand setup is written into the exercises for all the other double stops. Laurie: Is it possible to cultivate good double stops at an older age? Is there an age past which it's a little harder? What are the benefits of starting earlier? Simon: This is one of the most destructive myths – that if you haven't got your technique by the age of 20, it is too late because after that age everything takes so much longer to learn. This is nonsense which stops people from taking simple steps to improve their playing. You can learn and develop these skills at any age, and in fact adults often learn much faster than children or teenagers. Learning these or any set of skills depends first on your level of desire to attain them, second on the clarity and depth of the information you receive, and third on how much time you are able to devote to them. But it doesn't depend on age (assuming no physical disability). Anyway, too late for what? Too late to win an international competition? Even that is not necessarily true, though it certainly helps to have a large repertoire all ready to play at a moment's notice by at least that age, or perhaps more by 15, if you really want to end up winning Brussels, Moscow or Indianapolis. But how many people even want to aim for such things? Isn't there far, far more to being a musician than that? For everybody else, except that tiniest of tiny minorities who are aiming for a solo career, that "20" time limit simply does not exist, and neither does any other, really. I love the analogy – I think it comes from the American "success guru" Brian Tracy – that while there is the "three strikes and you are out" rule in baseball, in the "game of life" it is different: you are not only the batsman, but also the bowler and the umpire; you can bowl yourself as many balls as you like, and the only person who can call you out is yourself! If you want to call yourself "out" at the age of 20 or 25, or 30 or whenever, that's fine – but you don't have to! Laurie: It is my feeling that fingered octaves are impossible for me to play, with smallish hands and also no longer being a teenager. But I thought they were impossible back then, too. Are some people just incapable of fingered octaves, or do you find most can learn them? Simon: I always refer back to a lesson with Dorothy DeLay in which I was trying to play the 17th Caprice of Paganini, the one with the section in fingered octaves. She advised me to play the lower notes much more loudly than the upper notes so that the octaves would sound more in tune. "But that's cheating, Miss DeLay," I protested. "I want to play them in tune!" She had recently returned from Europe after sitting on the jury of an International competition (I think it may have been the Queen Elizabeth). "Well," she replied, "I have just heard about 20 top international-standard competitors play that Caprice, and not one single one of them played the fingered octaves in tune! So you can go ahead and try, if you like...!" It was very funny. Afterwards I realised that indeed neither the Perlman or Rabin recordings of the Caprices were truly in tune – and nobody else seemed to be either. So you are definitely in good company, Laurie! I have heard at least one person play them in tune, however. I was present at Midori's first-ever concert in the United States when she was 8, I think, up at the music school in Aspen. She played the Bach Chaconne and the Paganini 17th Caprice. In the Bach she got lost in the first bariolage section, and improvised her way back to the right key – almost as astonishing as the fact of her playing the piece at that age in the first place. In the Paganini, the fingered octaves were absolutely in tune, or seemed so to me at the time, since each octave had that blended, ringing quality that comes when they really are more or less in tune. And all on a tiny violin. On the other hand, it is said that there is no point in playing octaves in tune, since if you do, nobody really knows they are octaves! Better to play them slightly out of tune! But back to your question. First of all you should practice them occasionally anyway, even if you are never going to perform a piece that uses them, simply because afterwards your left hand feels so good – if, that is, you do them with the hand based on the upper finger and with the lower finger reaching back to its note, rather than the other way round. Secondly, I am fond of reminding myself that the trouble with ever thinking that we have a valid reason for not being able to do anything, is that usually we don't have to wait long before we meet someone who had even more reason than we have to not be able to succeed, and yet they have succeeded! It must be that there is someone in the world, somewhere, who is slightly older than you and has slightly smaller hands, who can play fingered octaves at least not too badly! So please practice these exercises and report back in one month, Laurie! Simon: I thought many times about including patterns in fifths, and also in fourths, and would love to have been able to fit them in. I even began to write some in the early drafts. After all, half the chords in unaccompanied Bach use them. It was just a question of space and page-count and not wanting the book to get too vast. Beside, nobody is ever asked to play 4ths or 5ths in scale exams at college, as far as I have ever heard, and I wanted to keep the book focused on what they would have to play. Simon: Third tones are like one of those funny, apparently random pictures made up of coloured dots, where you stare and stare, and then suddenly you see what they are a picture of. The picture was there all the time and you just couldn't see it, but now you easily can. It is the same with third tones, and once you have "located" them you can always hear them easily. And even if you can't hear them in the lower registers, you can still hear when the two notes of the double-stop blend in that smooth way that they do when the third tone is in tune. The question is, when does it matter that the third tone is in tune, and when does it not? This is a big subject. I have colleagues who maintain that every third or sixth must be tuned so that the third tone is in tune, but although I have tried to see things (hear things?) their way I simply can't. As far as I can tell, sometimes the third tone should be in tune and sometimes not, depending on the musical context. But I love the third-tone exercises in Double Stops. Getting the purity of the in-tune third-tone is surely the foundation of double-stop playing, even if afterwards you choose to ignore the third tone in particular instances for musical reasons. Laurie: What is the best link to buy your new book? Simon: Please go to my website (click here). July 1, 2016 at 06:47 PM · Would this book be suitable for violists too, or would the transposition be too difficult? July 1, 2016 at 06:53 PM · I presume this book will be excellent as Fischer's other books are. I'm working through his advice on chromatic scales in "Scales" at the moment and finding that useful. I noted that the list price is $40 at the current exchange rate of one pound = 1.33 US dollars. I think he should have included some advice about fifths as these typically drive students mad. While I think there is definitely cause for celebration if someone should come up with good studies to help students with scales in third, sixths, and (fingered) octaves, my own view as a rank amateur is that scales in thirds and sixths are not something to be feared. With some knowledge of how to shrink and expand major vs. minor thirds and sixths in "just" intonation, I think they will generally improve as one's overall intonation improves. At least that's what I've seen in my own playing. I like to practice scales in thirds because it sounds so good when you really nail it. I also noted that this new book is not published by Peters and I wonder why Simon changed publishers. The other books (I have "Basics" and "Scales") were quite nicely printed and bound. July 1, 2016 at 08:45 PM · I've had my copy for a couple of weeks, and have worked through some of the thirds exercises. So far, personal favorites are #3, 4, 5, 8, and 14/15. *Especially* #14/15! I haven't been doing a whole or half section a day, but maybe about 1/3 a page, with the metronome on a very slow tick. However, that is mixed in with some Sevcik Op.1 #4, Flesch, and Galamian. Paul, I didn't notice this book wasn't published by Peters, but the DS book is sewn, and the paper seems nice. There are no indications that it won't hold up as well as the Peters books. At 346 pages, it is heavy; wire stand users beware. My cost, with expensive but pretty fast shipping (a week from over there) came to $62.51 US. I bought my copy before the recent, uh, events in the UK, so the exchange rate might not favor the pound right now. Results may vary! I really like Fisher's scale book. I practiced it for a year, and then decided to re-vamp my student's scale curriculum, and teach it to my intermediate/advanced students. I've seen very positive results; the "Ears First Brain Second" types (I was one of those) have to think and understand what they are doing, and the "Brain First Ears Second" types are forced to listen, and subsequently their intonation over everything they play improves. Brilliant. This DS book has the same sort of potential. We'll see. July 1, 2016 at 11:46 PM · I have been practising this book for a few weeks now and it has made such a difference to my playing – both in double-stopped scales and in my normal single-stop playing too. It has really improved my general intonation and I am listening much better. Each exercise gradually builds towards the final double-stop scale in each key, but I have found it really helpful to transfer the exercises to double-stop passages in repertoire too. These exercises seem to reach all the bits that other double-stop books don’t! Paul, I agree that fifths are tricky. I don’t know if you have read Simon Fischer’s book The Violin Lesson, but he gives some amazing advice regarding fifths in that book. Reading that section was a bit of a revelation for me! Perhaps he felt he would be repeating himself if he included it in Double Stops? July 2, 2016 at 03:57 AM · Thanks Eve I will check that out. "The book would certainly work in all the same ways for the viola, and could be transcribed note-for-note. It probably will be within a year or so. There is already a viola edition of Warming up, and Peters are currently preparing the viola version of Scales. So a viola Double Stops would be in order. "As to whether someone could transcribe it in their head, as they go, would depend on their level of ability. Since all the exercises are in patterns, perhaps it would not be so difficult for violists to play off the violin edition." July 2, 2016 at 02:56 PM · Laurie, thanks for asking Simon Fischer about this! I decided to order the current (violin) version. I have Basics and The Violin Lesson, and haven't really felt any disadvantage because of the "violincentricity" of those books. I will look for the viola versions of the other two books, though. July 2, 2016 at 04:28 PM · I love his teaching; can't wait to get my copy! July 3, 2016 at 01:14 AM · At 30.00 GBP, plus 12.95 GBP shipping, the currency conversion to $US this 07/02/2016 comes to $57.00. I have to ask, might this book be available here in the US anytime soon, hopefully at a lower cost? July 3, 2016 at 06:47 PM · Laurie, thanks for a great interview. Your questions really got Simon F. going more into the meat of it. I was impressed by his quote about age not mattering so much because your mind is telling your muscles what to do. I also liked what he said about the "fearlessness of children". I discovered that myself while I was taking lessons--I really started making progress when I stopped worrying about making mistakes during lessons and just DID what the teacher asked. But as an adult, it took me years to get to that mindset. July 4, 2016 at 07:34 AM · Laurie - the problems with playing double stops which you mention - are really to do with bowing. If the bowing is right, then the fingers and your ear will get the double stops in tune. I've always had such problems in pieces where there is awkward (and not so awkward) double stops, but I've realised with me at any rate it is the bow causing the problems. When we can pull a straight down bow and a straight up bow on one string then two strings are no problem. (I don't mean the bow has to be straight necessarily all the time particularly at the point). We struggle with the fingers when the culprit is the bow! July 4, 2016 at 10:10 AM · "This is one of the most destructive myths – that if you haven't got your technique by the age of 20, it is too late because after that age everything takes so much longer to learn. This is nonsense which stops people from taking simple steps to improve their playing. You can learn and develop these skills at any age, and in fact adults often learn much faster than children or teenagers. Learning these or any set of skills depends first on your level of desire to attain them, second on the clarity and depth of the information you receive, and third on how much time you are able to devote to them. But it doesn't depend on age (assuming no physical disability)." This is what I have been saying all along. It's so inspiring to hear this from Mr Fischer himself! I have almost all of his other books and they are all outstanding, The Violin Lesson and Scales is my daily violin bread & butter. I am eager to order a copy of double-stops and will certainly do so today! July 4, 2016 at 12:18 PM · I gather that an intelligent person could probably adapt much of Fischer's work to the cello. Many of the principles should apply. But with the differences in ergonomics, hand positions, direction of gravity relative to the bow, and of course fingerings, it's not a trivial conversion. That leaves me to ask: Who is the Simon Fischer of the cello? The modern pedagogue who is synthesizing the best practices into a sound and thorough treatment of cello technique? July 5, 2016 at 10:18 AM · Is it true that what gives bluegrass fiddling its unique sound is that the double stops are (usually) slightly out of tune ? I thought I read that on this site somewhere ? July 5, 2016 at 06:25 PM · Brian, I wouldn't be surprised, but there are elements of that in classical music as well. For example, if you play an octave perfectly in tune, you basically can't hear it. Heifetz used to talk about played octaves ever-so-slightly out of tune, to make them audible. July 5, 2016 at 06:50 PM · I play "Heifetz" octaves ALL the time - you can hear them alright :) What's the point of slaving at them if you can't make the audience cringe a little for added drama?!? July 5, 2016 at 07:17 PM · Phew, I thought I was the only one who thought that the top note of an in-tune octave disappeared into the bottom note (maybe there was something wrong with my hearing).